The College of Media and Entertainment’s graduation party in Bragg included (left to right) Electronic Media Assistant Professor Tom Neff, Center for Innovation in Media Director Val Hoeppner, film and music producer Dub Cornett, Recording Industry Chair Beverly Keel and HBO executive Kary Antholis. Students received a rare end-of-the-semester opportunity to speak one-on-one with an award-winning filmmaker and executive responsible for HBO’s John Adams, Mildred Pierce, Angels in America, From the Earth to the Moon and Cinemax’s The Knick. 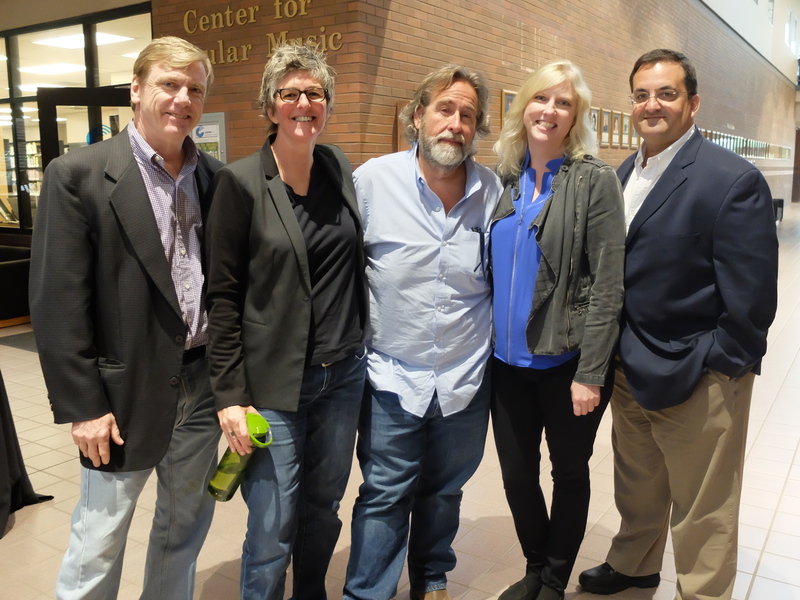 On May 6, HBO President of Miniseries Kary Antholis stopped by the Bragg Media and Entertainment Building to talk to students, faculty and staff about his career and how to make connections in the entertainment industry. Antholis was given advice as a young man to find “diamonds in his own backyard,” words he continues to follow as an executive of one of the world’s biggest networks. Antholis was introduced to MTSU President Sidney McPhee at the Glenn Frey tribute at The Troubador in Los Angeles during Grammy weekend earlier this year. McPhee invited the executive to be the afternoon commencement speaker for the 2016 Spring Semester graduation and asked him to speak to students in the College of Media and Entertainment during his campus visit. Senior Matthew Boyd said he was “thrilled” to interview HBO exec Kary Antholis for his WMTS 88.3 radio show. In Bragg 104, Antholis encouraged students to concentrate on developing excellent writing, reading and analytical skills while in college. 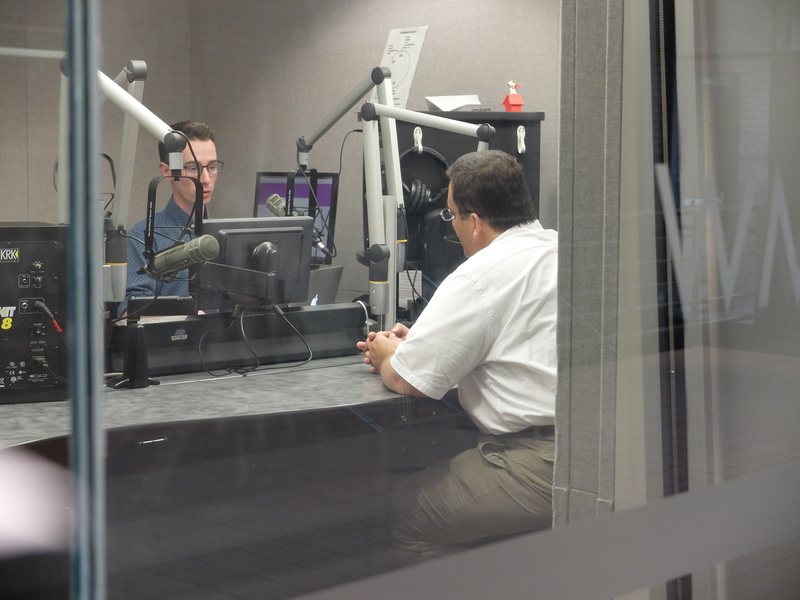 He answered multiple questions about his career path from young filmmakers in the audience, and later was guest on senior Matthew Boyd’s WMTS radio show. Afterward, he came to the college’s graduation party to speak with parents, faculty and alumni. Antholis won an Academy Award in 1995 for his documentary short subject “One Survivor Remembers,” a film about Gerda Weissmann Klein, the only member of her family to survive the Holocaust. During his acceptance speech, the filmmaker handed the Oscar to Klein, and after saying a few words, graciously turned the microphone over to her to speak. It’s considered one of the most memorable acceptance speeches in Academy Award history. Click here to watch Antholis’s Oscar speech. 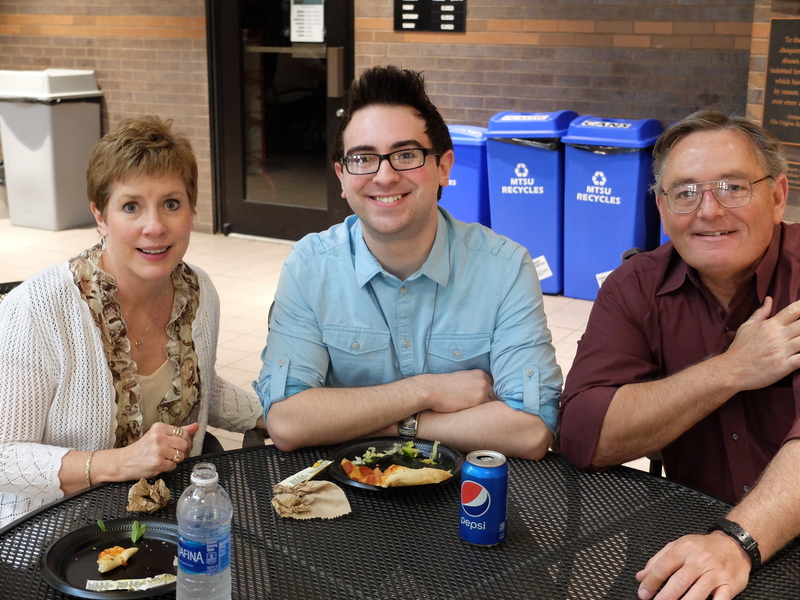 Graduating senior and public relations major Colby Denton and his parents celebrated with friends and faculty at the college’s graduation reception in Bragg. 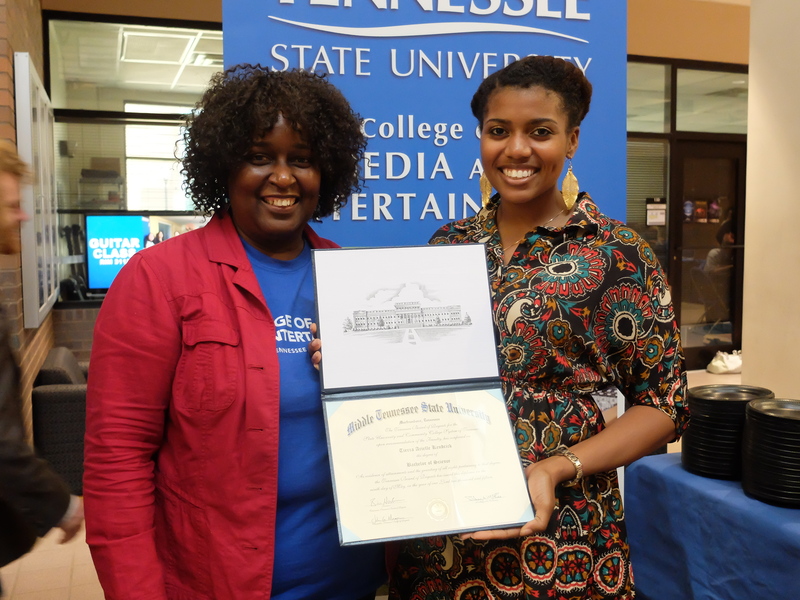 Recording Industry Assistant Professor Gloria Green (left) is surprised by a visit from former student and 2015 alumna Tierra Kendrick. Kendrick is currently stationed at Hunter Army Airfield in Savannah, Georgia.